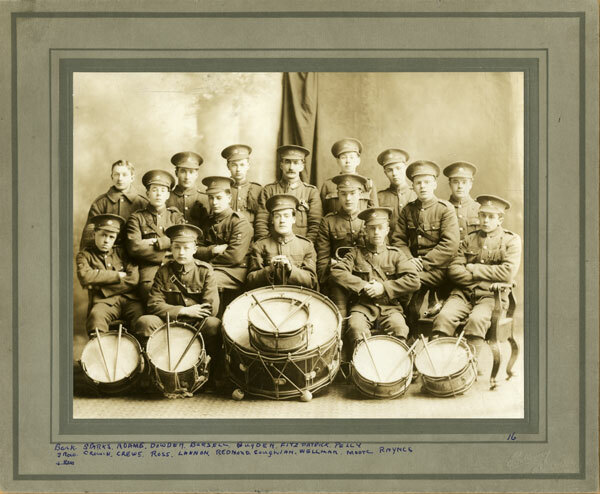 [Newfoundland] Regiment Drum and Bugle Band. [1916-1917] Courtesy The Rooms Provincial Archives Division, MG702, Item B 1-138. We’re excited to explore the wartime activities of another interesting woman this week; the portraitist and businesswoman Elsie Holloway. Along with her brother, Bert, Elsie established Holloway Studio in 1908, the first portrait studio in Newfoundland. Both siblings were accomplished photographers, with Elsie focusing on portraits and Bert on landscapes. The Holloway children were introduced to photography by their father, Robert Edwards Holloway. The elder Holloway emigrated to Newfoundland in the 1870s and worked as the principle of what became the Methodist College in St Johns. Holloway was deeply interested in science, despite receiving no formal training in the discipline, and established a state-of-the-art lab at the college. His passion for technology led him to photography, and Holloway soon became a noted landscape photographer. After the death of their father in 1904, the Holloway children opened their studio, with Elsie as the portrait photographer. At the outbreak of the war in 1914, Holloway Studio had grown into a large and popular business. As with other enlistees, many of the volunteers for the Newfoundland Regiment wanted their portraits taken, and the studio was the perfect place. Elsie Holloway’s portraits of the “First Five Hundred”, and later drafts for the regiment document the volunteers that the Dominion of Newfoundland sent to war. Most were taken on glass plate negatives, which are held today by the Rooms in St Johns and still used for digital reproduction. After Bert Holloway enlisted with the regiment in 1915, Elsie continued to run the studio by herself, photographing the departing soldiers, including her brother. For Elsie, the war brought an opportunity, though at a terrible cost. Bert’s departure for Europe meant that she was now fully responsible for the business of the studio; one of the first changes she made was to ensure that all Holloway Studio work was copyrighted. In the spring of 1917, Bert was killed at the battle of Monchy-le-Preux, and Elsie Holloway was left the sole owner of the studio. She continued to work throughout the war photographing departing soldiers, and documenting life in the Dominion during the war years. The studio continued to grow and prosper, despite the grim economic times in Newfoundland after the war, and Elsie Holloway became famous for her portraits. She was asked to photograph the departure of Amelia Earhart from Harbour Grace, Newfoundland for her flight around the world, and provided photography services for the Royal Visit in 1939. Elsie Holloway retired in 1946, and the studio was taken over by Marshall Studios. Like many women in business in the first half of the 20th century, Elsie Holloway never married. She died in 1971. Thank you Arlene! We sent you an email with the details. Thanks for the background on Holloway studios. I have many restored and colorized images of the Royal Newfoundland Regiment. If you are interested in using them, just let me know. Hi Gerard! We’re always interested in seeing new material. Our features for the Newfoundland Regiment are over for now until the Monchy centenary in March, but we’ll keep you in mind. Thank you for your generous offer! Just a small clarification – There were earlier portrait studios in St. John’s, notably Simeon Parsons, later S.H. Parsons and Sons, that dated from the 1870s. Prior to his enlistment in the Regiment, Bert Holloway (a member of the Legion of Frontiersmen) assisted with the attestation of recruits – this would have made Holloway one of the first contacts with the volunteers. There is a poignant portrait of Bert taken by Elsie prior to his departure from NL, which was published in The Distaff, a periodical published by the Women’s Patriotic Association. Thank you Jessie! We’re always so happy to have people bring new pieces of information for our blogs.